Your satisfaction is our benchmark: to be able to provide our passengers with ultimate comfort and safety, it goes without saying that we exclusively use modern, reliable trains. We select our trains based on the transport volumes on the routes, as well as taking geographical conditions into account – always in coordination with our transport authorities and dependant on contractual conditions. The interior quality of our trains speaks for itself: the carriages have comfortable seating as well as ample space for bicycles, pushchairs and large luggage (with normal train occupancy). In addition to ticket machines on every train on the Hellweg, OWL and soon also the TWN networks, electronic information displays and audio announcements provide you with up-to-date information about your journey. You're always on the safe side with Keolis! TALENT stands for "Talbot leichter Nahverkehrs-Triebwagen" (Talbot light suburban railcar) and is produced by Bombardier Transportation (previously Waggonfabrik Talbot). FLIRT stands for "Fast Light Innovative Regional Train" and is manufactured by the Swiss rail manufacturer Stadler Flirt for S-Bahn and regional transport. FLIRT 3 has several technical changes compared to the original FLIRT. Most notable is its newly designed front. In addition, the driver's cab has a separate entry door. 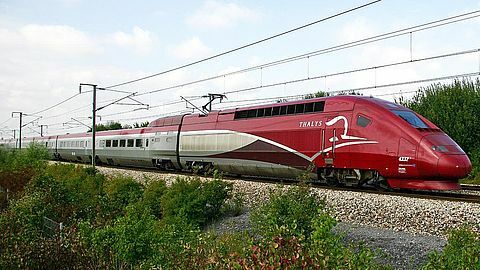 Thalys is a European high-speed train that is technically comparable to the French TGV. It is designed for international rail transport.